Question: My Persian cat has a huge white bubble on the side of his face. I only noticed it about a week ago but my mother said its been there a while. It has a few black dots in the middle. My cats doesn't seem to notice it and hasn't acted any differently. What is it? what should i do? Skin is a complex body organ, which can be affected by numerous conditions. Note that since we are looking at a picture vs. an in person detailed clinical examination and tests, we can only guess at the cause of this cat skin problem. Based on your description and the picture, we can provide you with some tips that can help you manage this cat skin condition and we can also give you an idea as to its cause. As you described, this thing was on the cat's skin for a while now, and it has grown with time. Also, in the picture, it seems that the surrounding area of black spots is alopecic (hair loss) and the black spots appears to be nodular in shape, and most importantly these lie in the middle of the “bubble” or swelling. Additionally, this condition does not cause any discomfort to your cat and does not cause any extraordinary localized or generalized symptoms. In the light of these observations, it appears that this cat skin condition is not “contagious” or widely spreading, and that it is not causing any major pathological changes in the deeper skin tissues, otherwise other clinical signs would have been exhibited. melanocytes (pigment cells) at the base of the hair follicles. Most probably, this is some kind of cutaneous melanocytic benign tumor and/or cysts, which occurs frequently in cats, especially in the head area, toes and feet. Usually, they are not that dangerous for cats, but if they grow over time and cause some problems with the normal physiology of an affected cat, or cause an anatomical deformity of the cats face; surgical excision is the treatment of choice. Here, we suggest that you consult a nearby veterinarian for a detailed examination and biopsy of the cyst. As mentioned, this cat skin problem can be anything from acne to tumors and cysts, which should be diagnosed before it causes a severe health problem for your cat. While your cat is being diagnosed, we suggest that you should use supplements containing vitamin A & E such as Pet Tab Vitamins & Mineral Supplement. Vitamin A & E has an effective role in combating cat skin problems related to melanocytes or pigment cells and hair follicular base problems. This is for support only and will improve the strength of cat hairs and the outer layer or epidermis of the skin. Additionally, some natural remedies that contain natural anti-oxidants such as C-Caps and skin tonics such as Skin and Coat Tonic can improve skin, immune and the overall health of your pet, preventing any possible complications. It appears that this condition will not cause any serious problem for your cat. That said, it is always better to have a cat skin tumor or cyst examined and diagnosed, since it has grown over time and is causing alopecia in the surrounding areas. Best wishes to you and your cat. 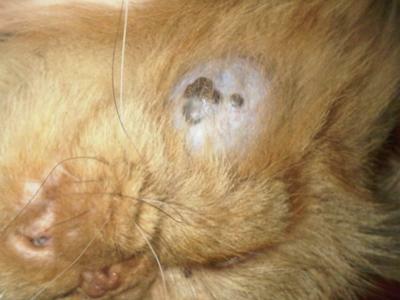 Please keep us up to date on your cats skin cyst problem. Thank you for the analysis and the picture. My cat Zoey has a similar growth underneath her chin that I only noticed recently. I went to the vet last week and she was given clavamox 65.5mg x 2 a day for a week. No change, will go back tomorrow and schedule biopsy and blood work. I hope it is not cancer! Thank you.